With 40%* protein, CRAVE Adult Dry Cat Food is inspired by a cat's natural diet. Real Chicken is the first ingredient and these protein-rich recipes provide cats with energy and supports lean bodies. Cats want the taste and nutrition of a diet that’s rich in animal proteins — not soy or grains such as corn or wheat. And the reason is simple. Protein-rich diets provide the nutrients for a lean, healthy body and the energy to play. 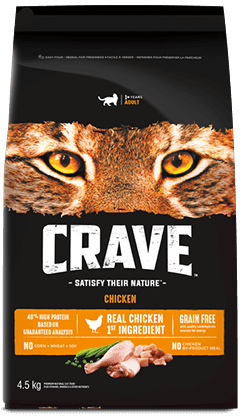 Like the diets of their wild cat ancestors, CRAVE recipes are always crafted with real, high-quality animal protein, the meaty flavor cats love and no grains. 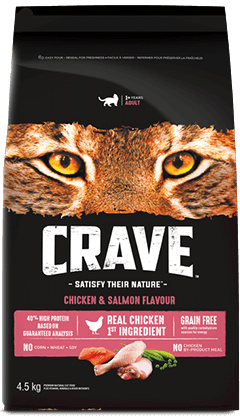 CRAVE Chicken and Salmon Flavour Cat Food is formulated to meet the nutritional levels established by the AAFCO Cat Food Nutrient Profiles for adult maintenance. Every cat is different. These are suggested feeding amounts based on the ideal body condition for adult cats of various sizes and weights. Your individual cat’s energy requirements may differ. Adjust the amount fed to obtain or maintain your cat’s optimum weight, provide plenty of exercise and visit your veterinarian regularly. Always provide fresh drinking water and serve this food dry or lightly moistened. To help maintain freshness, we recommend sealing the bag tightly and storing it in a cool, dry location. When feeding CRAVE Cat Food for the first time or changing recipes, we suggest you blend increasing amounts of the new recipe with your old cat food for six days. © 2018 Mars or Affiliates.